Just used your code to order parts for the Caravan. Did you know that Turkey's can really cost you a lot of money if you hit one? I am replacing the front bumper cover, grill, support panel and hood, thanks to a 15lb young wild turkey. Sad really. Of course, what's sadder is today's insurance. Shop estimated the repair at 2400, with replacing the front bumper, repairing the hood (which is rusted to crap and non-repairable) to the insurance saying it should only cost 1400 and you have to repair the bumper and hood. Condenser is bent too, so it would have to be replaced. I just spent a little more than 350 bucks for a NEW hood, NEW bumper cover, NEW grille and NEW support panel WITH THE SHIPPING!!! Stupid insurance. Stupid repair shops. I still have over a grand, and a lot of that will go to my painter for the paint and labor. And it will be done. Got to love having RA around. Oh my discount with your code was nearly 12 bucks. LOL Shipping was almost half the cost btw. This discount code expires on September 25, 2011; so don't wait! Last edited by 3X00-Modified on Wed Aug 10, 2011 1:26 pm, edited 1 time in total. Just placed an order using my code today for van parts. 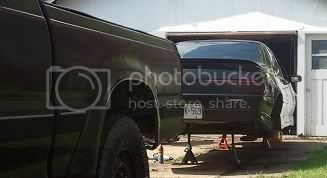 Saved 7 bucks on a 285 dollar order.... lol Ordered my fender, lights, and skirt for the 03 caravan today. Wish rockauto would give 10% codes!!! Thanks for the link, I'll keep it in mind. PS: I cannot access that link at work, but I can jump on B.net and copy/paste a code from this thread! Your discount code is: 77272255296391 This discount code expires on February 5, 2012; so don't wait!